Byron and Toni Mallott of Juneau have donated a basket made by master Haida weaver Delores Churchill to Sealaska Heritage Institute (SHI) for its ethnographic collection. The basket, named “Half Head of Salmon Berry,” is an exquisite piece made of red cedar bark, grass and alder-dyed cedar bark and valued at $3,000. The Mallotts purchased the piece at SHI’s Tináa Art Auction in 2017 and gave it to SHI because of the institute’s robust education program that allows Northwest Coast students and researchers to study its pieces. The quality of care the basket will receive was also important to them. SHI President Rosita Worl called the donation a blessing. The Mallotts donated the basket in memory of Clarence and Gertrude Louise (Lidda) Jackson of Kake. Clarence, who passed away in 2013, was Tlingit/Eagle of the Tsaagweidí (Killerwhale) Clan. Clarence adopted Toni Mallott, who is Athabaskan, into the Tsaagweidí Clan. The basket is a mini-masterpiece of complex design employing a double-warp of red cedar on the sides, a weft of yellow cedar, and a uniquely Haida weave between the two warps called ”spiraling like a sea shell.” The diamond pattern on the upper portion is called “half-head of the salmonberry.” Her use of natural dyes on lighter material is also evident in the piece, the alder-dyed yellow cedar creating a striking contrast to the natural cedar bark. Churchill has dedicated her life to the revitalization and continued teaching of traditional basket weaving in the Haida, Tsimshian, and Tlingit styles. A versatile and highly-skilled artist, she is also known for her fine Ravenstail and Chilkat weaving. Born in Masset on Haida Gwaii, Delores was taught to weave by her mother, Selina Peratrovich. Delores has traveled all over the world to view and study the techniques of old masters and has been instrumental in the revival of spruce-root weaving in Southeast Alaska. Churchill, through her study of an ancient hat found in a melting glacier between Alaska and Canada near the remains of an indigenous man in 1999, rediscovered a weaving technique that had been lost and was not known by contemporary artists. She has since reintroduced the technique. 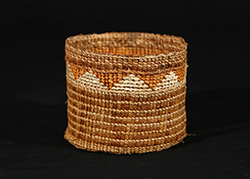 Caption: “Half Head of Salmon Berry” basket by Delores Churchill. Photo by Brian Wallace.